If you are close to London, Knoxville or Los Angeles and still have some time beside all your preparations for Christmas you may have an interest to attend one or the other of the events we are highlighting in this NewsLetter. Also our next two case studies on Olympic sports might catch your attention. In addition you will find links to the Classical Spectaculars at the Royal Albert Hall, the RHCP world tour or the Los Angeles Music Awards. Skycam is the trademarked brandname of a patented, computer-controlled, stabilized, cable-suspended camera system. The system, similar to Steadicam, but maneuvered through three dimensions in the open space over a playing area of a stadium or arena by computer-controlled cable-drive system, is responsible for bringing video game-like camera angles to television sports coverage. The camera package weighs less than 14 kg and can travel at 13 m/s. NBC debuted the first wire-flown remote-controlled camera used in sports coverage in February 2001 for the XFL. ESPN first used Skycam in 2001 for an NFL pre-season telecast and then consistently in 2002 for Sunday Night Football broadcasts. Since then, ESPN and sister-network ABC have made widespread use of Skycam for NCAA football, Monday Night Football and Super Bowl XXXVII respectively. S-TV will become a subsidiary (100%) of Euro Media France and will bring with it new skills in the guise of mastery of production in the realms of Satellite broadcasting (with Globecast as a partner) with multi-camera SD/HD. These SNG resources (Satellite News Gathering) will strengthen Euro Media France’s existing fleet of mobile units, made up of 12 OB trucks (7 of which are HD), 5 HF trucks (HD), 6 editing/graphics/Slow-motion trucks (HD) and 1 Fly control room (HD). On a larger scale it will also compliment the established range of services provided by Euro Media Group on an international level. Furthermore, the company S-TV also offers other types of service such as the production of institutional films, documentaries and reporting. Lastly, it has post-production facilities at its disposal (graphics, titling and credits, creation of DVD/CD-ROM). Broadcast Rental, a full-service rental house, has recently invested in five new 8-channel XT3 production servers from EVS. “The new generation of EVS servers will broaden our customers’ recording and live production capabilities with 3Gbps in/out channels and an increased internal bandwidth of up to 550 Mb/s per video channel” explained GP Slee, Managing Director and founder of Broadcast Rental. The XT3 servers, which have been delivered with the new Multicam11 software, can be used to ingest multiple feeds from various sources including cameras, satellite, craft editors and video tape recorders. They can be configured to support up to eight HD channels or six 3D/1080p channels in multiple IN/OUT modes and are controlled with EVS’ MulticamLSM remote controls, which allow operators to create clips, produce live action replays (including Super and Ultra Slow Motion) and highlight packages. Mediatec is one of Europe’s largest corporations working with technical solutions for event and television productions. There core philosophy is to supply the right technology and to seamlessly provide robust working systems. Their field of expertise provides technical solutions for the media, event and sports industries and to meet the different needs of their clients they work in four interrelated areas; Broadcast, Display, Events and Installations. Mediatec are operational with the installation of the miniHUB optical fiber distribution system. The Oslo broadcast center is a busy portal for international sports with repurposing facilities, as well as handling local and international feeds for Rikstoto horse racing operations. HD-SDI signal transport over this distance was only possible by installing an Optical fiber system between Bjerkebanen Race course and the Oslo broadcast center in Økern Torgvei (OTV). This coupled with the miniHUB system by Norwia was an ideal partnership to provide a cost effective and quality system. The brand new partnership with the US-based special camera supplier SKYCAM and the relationship to the US sports broadcaster ESPN provided the opportunity to introduce the Antelope MkIIs on the US market with a rolling thunder - in the true sense of the word. ESPN chose the NHRA Arizona National Dragster Race for the USA debut of LMC´s UltraMotion System. The event was taking place between October 14th and 16th at the Firebird National Raceway in Chandler, Arizona close to the city of Phoenix. The Antelope was used on 2 camera positions - first to show the extreme power of the race cars at the start line and on the second position to provide stunning replays of the high speed passing directly next to the fastest part of the racetrack. Since 1992, badminton has been an Olympic sport with five events: men's and women's singles, men's and women's doubles, and mixed doubles, in which each pair consists of a man and a woman. At high levels of play, especially in singles, the sport demands excellent fitness: players require aerobic stamina, agility, explosive strength, speed and precision. It is also a technical sport, requiring good motor coordination and the development of sophisticated racquet movements. At London 2012, there will be five medal events: men’s and women’s Singles, men’s and women’s Doubles, and Mixed Doubles. All events will begin with a preliminary stage: the competitors will be divided into groups, and each player and doubles pair will play everyone else in their group. The best players and doubles pairs from this stage (16 in each Singles event, eight pairs in each Doubles event) will qualify for the knockout stage of the competition, which will eventually decide the winners of the medals. At the London 2012 Olympic Games, one of the world’s most popular and fastest-growing team sports will be showcased at the Basketball Arena and the North Greenwich Arena. The 2012 basketball tournament will follow the established format of 12 teams, divided into two pools of six. Those teams, apart from the holders and hosts, traditionally qualify on a continental basis. The rules are simple enough: you have a hoop 10 feet above the ground, you get two points for throwing the ball through it, three points if you are outside the three-point line, and one-point for a free-throw, which is awarded for a transgression. In Olympic basketball, games consist of four quarters of 10 minutes (as opposed to the NBA, which has 12-minute quarters). The clock is stopped when there is a delay, stoppage, substitution or time-out, so although there is 40 minutes of actual playing time, games usually last a lot longer. There are no draws in basketball. If the scores are level after the fourth quarter, a five-minute overtime period is played, followed by further five-minute periods as necessary. The Loudness Summit is a gathering of technology experts, legislators, operators, and industry professionals involved in delivering high-quality broadcast sound. The event is expected to draw more than 200 leaders from major firms in the professional audio and broadcast sound industry. "Thanks to loudness, audio for broadcast is finally getting the attention it deserves," said Carroll. "Now is the time to address real issues such as meeting viewer expectations with quality sound in any circumstance, and I look forward to the discussion." The Loudness Summit takes place on Friday, Dec. 16, 2011 at the Royal Institute of British Architects in London. The event opens at 8:00 a.m.
RED OPEN HOUSE is a rare and not to be missed event hosted by RED Digital Cinema at RED Studios Hollywood .The night will be filled with opportunities for attendees to view new RED centric products, learn RED best practices, hear latest buzz in filmmaking and hang out with other industry professionals. Special presentations to the community will be made by insiders at RED, as well as a screening of footage in 4K and 3D. RED OPEN HOUSE is hosted the last night of the popular 3 day REDucation course taught by Ted Schilowitz. REDucation continues on Thursday and Friday, December 8th-9th with 2 day advanced classes - Shooting 3D with RED taught by Mark Pederson and RED Advanced Post Production taught by Michael Cioni. Planned for December 9, January 26 and March 15, 2012, the courses are conducted by independent ex-BBC sound engineer Micky Curling in Studer’s purpose-built studios providing the perfect opportunity for freelance and in-house engineers to get hands-on experience with Studer consoles. 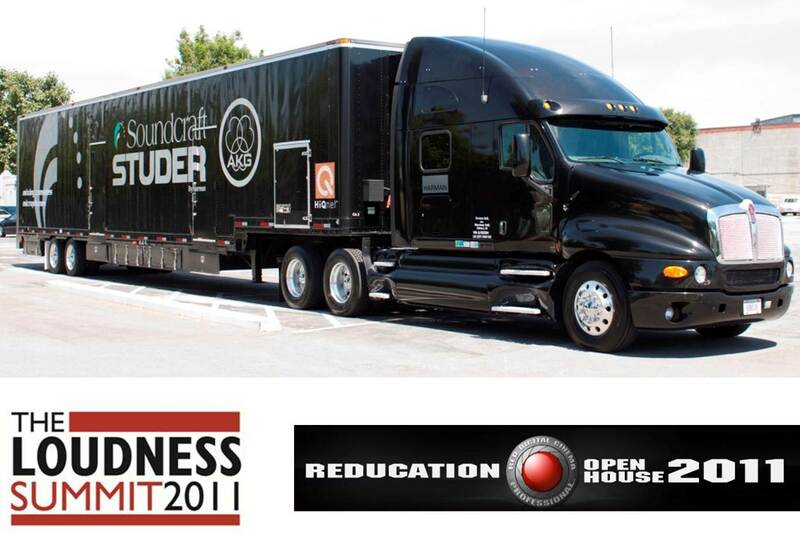 All attendees will be offered lunch, as well as morning and afternoon refreshments, and will also be given a tour of the impressive Soundcraft and Studer manufacturing facility. In the adjoining museum attendees are able to view consoles and tape machines from both Studer and Soundcraft’s past, dating back to the 1950’s. For those interested in detailed training and factory certification, Studer also offers full-day courses on the Vista series: “Vista Foundation” includes product overview, Vistonics™ U/I and general operation, connection with third-party networks including Optocore and Aviom, and integration with Riedel’s RockNet and MediaNet. “Vista Intermediate” includes more advanced topics such as detailed presentation of the DSP, I/O formats, Virtual Vista remote control and system redundancy. Premier Global Production, which serviced the band for their last world tour, has returned as the lighting vendor for the new tour working with lighting designer Scott Holthaus to fill his equipment needs. Holthaus uses four grandMA full-size, one running video from Catalyst and D3 servers and the other running lighting, two grandMA full-size are back-up. “They are wonderful, powerful machines – I used the grandMA on every tour and they always work great, never a problem,” he says. “Of the 275 shows I did on the last tour, I only went to our spare desk once.” He praises the grandMA’s “sound operating system” and likes its ability to handle some of the server work. “The effects engine is really good. In the hands of a capable programmer, grandMA can do anything a designer can dream up.” Holthaus’s “right- and left-hand man” for lighting and video on the tour is Leif Dixon; the lighting programmer is Zach Peletz. Mongolian band AnDa Union are using DPA microphones on their current world tour to provide a powerful live sound for a large and wonderful variety of acoustic instruments. The band, who hail from Hohhot in China, formed in a mission to discover and perpetuate their Mongolian musical heritage, and have been performing worldwide for the past eight years. The mics were supplied by DPA’s UK distributor, Sound Network. AnDa Union is currently in the middle of a two-month US tour performing mostly at major universities. The tour will continue through China, Australia, New Zealand and Europe in 2012. Sound rental company, RG Jones has been producing sound reinforcement infrastructure for the challenging Raymond Gubbay Classical Spectaculars at the Royal Albert Hall since 1993. With production harnessing cannons, pyro and lasers in a festival type ‘Proms’ atmosphere, it has taken all of FOH engineer Simon Honywill’s expertise to keep the show’s audio fidelity evolving with each generation of new technology. Honywill is no stranger to Martin Audio proprietary line array platforms, introducing W8L Longbow systems to the Glastonbury Pyramid stage, and taking the new award-winning MLA (Multi-Cellular Loudspeaker Array) on tour with Jeff Wayne’s War Of The Worlds. Rigging the MLA at the Royal Albert Hall for the first time ever this month, he knew the Classical show would experience the same dynamic range and sudden transients as War of the Worlds — and in a venue notoriously difficult to control, he also knew it would clean up the room’s inherent reflections. But the performance, he said, was breathtaking — and even beyond his expectations. Held in the iconic Avalon in Hollywood, AKG supplied an arsenal of equipment to support the night filled with emotionally exciting performances and award presentations. AKG’s WMS 4500 wireless system and D7 capsules were used for all vocal performances, while wired D7’s completed the stage vocal tasks. The DMS 700 handheld units were utilized for the podium and presenters. From the Studio to the Stage, the C214’s mic’d the guitar cabs and a C4500B was used for bass. The Perception Groove Pack clipped to the main drum set was combined with C414 XLII’s for overheads. Two D112’s, D40’s and C415B’s were clipped on the Chopper drum set, which resembles a chopper-style motorcycle. World-renowned pianist David Osborne, more commonly known as the “Pianist to the Presidents,” placed a studio pair of AKG C414 XLS’s on the grand piano during his recital at the ceremony. Osborne has played in the White House for numerous presidents, from Jimmy Carter through President Obama. The Production Control Application is a complete, semi-automated solution that works with existing control room equipment to simplify production control, expand production capabilities, enhance production look and branding, and minimize production errors. Broadcasters can control up to 24 channels of VTRs, DDRs, video servers, and graphic devices for on-air and on-set playout from highly reliable, easy-to-use, tactile control panels and their production switcher. Because the Production Control Application can automatically control multiple machines synchronously with the touch of a button, the technical director is free to concentrate on the production rather than the technology. Additionally, the Production Control Application streamlines pre-production setup and last-minute on-air changes for late-breaking and unscripted events. Within three months of launch on August 24th 2011, the first independent news channel in the state of Tamil Nadu has been rated as number one in the market, according to figures released by AC Nielson. The channel is based in the capital of Tamil Nadu, Chennai, home to 74 million people, where Tamil is their first language. The state is India's seventh most populous but with its highly urbanised population is the fourth largest contributor to India's GDP. The station motto is ‘unmai udanuk udan’, or 'truth as it happens’. News Director, Mr S Srinivasan had no hesitation in attributing the runaway success to an honest news service, stripped of any political bias or opinion. As a reaction to the demands of growing East-European markets in Russia, Ukraine or Belarus, Riedel Communications opens a new branch office in Moscow Office. The office in Moscow is the tenth Riedel branch office besides offices in the US, Asia, UK, Europe or Australia. “Now that we’re starting our own office in the Moscow, we have the opportunity to establish a more direct contact with our existing customers here”, says Yevgen Khovanskyi. "This way Riedel can provide a more direct service for existing and new customers within this area", Khovanskyi continues. Recent projects in this region include the studio installation at the Kiev based broadcast network STB, the Moscow business broadcast network RBK or ANO Sports Broadcasting. Egyptian TV's new reference studios feature a variety of intercom systems from RTS/TELEX. The heart of the command centre is formed by two modular Cronus matrices – each with 32 channels. Although connected with one another, and therefore forming a logical matrix, the two devices are nonetheless autonomous and capable of being operated independently. Among the other components installed are 15 KP-32-16 and three KP-32 keypanels, a full-duplex BTR-800 wireless station, and a large number of TELEX TR-800-C6 beltpacks and TELEX PH-44R headsets. A TIF-2000 digital hybrid telephone line interface from RTS, which is compatible with Cronus, ADAM, and Zeus matrices, rounds off the installation. "We have been working with RTS/TELEX systems for years and have had nothing but positive experiences with them," explains Ahmed Gamal Saleh, Managing Director of System Design. Malaysian broadcasting service provider MEASAT Broadcast Network Systems Sdn Bhd (Astro) has selected STAGETEC ON AIR 24 mixing desks to equip its Press Suite studios at its Bukit Jalil facility and Cyberjaya facilites. The contract included four ON AIR 24 each of which features eight faders and pre-configuration for the specific task. Since two mixing desks had to fit into one single studio, they do not feature monitor sections. Instead, monitoring is achieved via the compact 1 HU STAGETEC AUDIO MONITOR (SAM) monitor control unit introduced earlier this year. It provides direct source selection via 16 keys and – made possible by the use of four layers – selection of up to 64 sources in total. The NEXUS comprises a local Base Device for each desk which provides all local I/Os such as commentary booth and instance replay machine. Further Base Devices are located in the central machine room as backup for the local devices and for SDI de-embedding and embedding. The sinaCAM HDC1-D is a ultra compact remote head camera. It features a 2004×1144 2⁄3″ CCD-Sensor capable of up to 60 FPS progressive scan and features a true global shutter. It has a high Sensitivity of 10 Lux/F2.2 The camera head connects to the recorder via single 75Ω BNC cable at distances up to 200m. It features a C-Mount as well as an optional B4-Mount Adapter. It delivers identical 3D image properties thanks to a single processing unit for the two cameras. Cutting edge 3D company Zero Creative BV (The Netherlands) and Nirmitha Technology Solutions India, proudly announce their new Joint Venture: Zero Creative 3D Solutions Pvt Ltd. The new office in Chennai is located at Taylors Road, Kilpauk, Chennai. Both Directors, Sankar Venkatraman, Managing Director Nirmitha Group and Jean-Pierre van Maasakker, CEO Zero Creative Netherlands, are confident about the future of 3D services for the ever expanding Indian market. "The official launch event took place Friday the 25th of November at Hotel Green Park in Chennai. We invited everyone interested in innovative 3D solutions to all spheres of business to come over and celebrate with us", said Sankar Venkatraman. "During the opening we demonstrated exciting glasses-free 3D marketing solutions and even touch-less interaction. Besides we organized a networking diner", said Jean-Pierre van Maasakker.